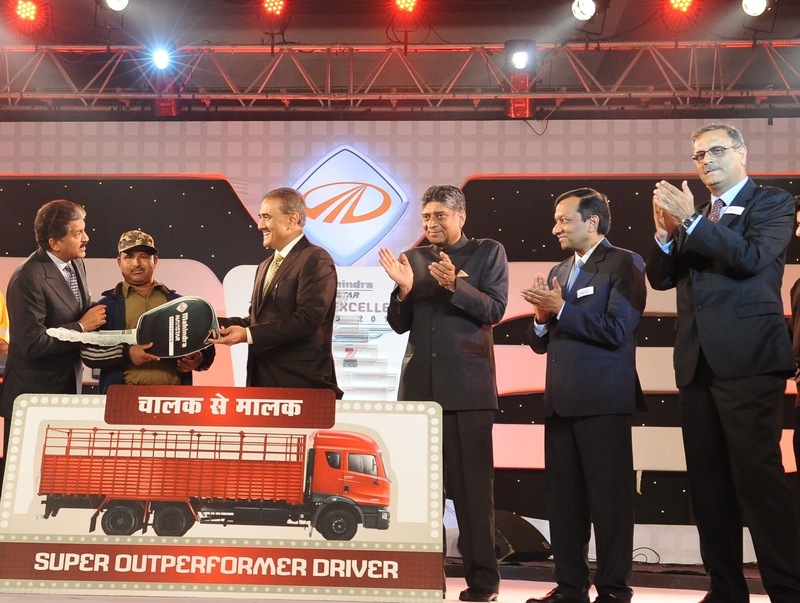 Mumbai, December 20, 2011: Mahindra Navistar Automotives Limited (MNAL), a part of the Us $ 14.4 billion Mahindra Group, felicitated and awarded the heroes of the Indian transportation industry. At a glittering ceremony held yesterday in New Delhi, the first ever Mahindra Navistar Transport Excellence Awards 2011, were presented. These awards recognized and rewarded Outperformance, Excellence, Innovation and Change Leadership in the Transport Ecosystem – values which embodies the spirit of MNAL. Prominent transporters from across India, dealers, and 38 winners from different walks of transport ecosystem witnessed the glorious ceremony dedicated to the Transport Industry. These winners were celebrities in their own right, unsung heroes of the Indian Transport Ecosystem. Each one of them had a different story of their own to narrate, all relating to their endeavor to achieve in excellence by, ‘Accepting No Limits’, ‘Alternative Thinking’ and ‘Driving Positive Change’, the three facets of Mahindra’s much talked about Rise initiative. The event was graced by Shri Praful Patel, Honorable Minister of Heavy Industries & Public Enterprises, Govt. of India as the Chief Guest. In addition, Mr. S. Sundareshan, Secretary, Ministry of Heavy Industries & Public Enterprises, Mr. Anand Mahindra, Chairman, Mahindra Navistar Automotives Ltd. and Vice-Chairman & Managing Director-Mahindra & Mahindra Ltd., Dr. Pawan Goenka – Director, Mahindra Navistar Automotives Ltd. and President, Automotives & Farm sector - Mahindra & Mahindra Ltd, Mr. Nalin Mehta Managing Director – Mahindra Navistar Automotives Ltd and Mr. Barun Das, CEO, Zee News Ltd were amongst those present at the awards ceremony. Speaking on the occasion, Dr. Pawan Goenka, said, “Mahindra Navistar, as the challenger brand, has taken on the onus of making a difference in the lives of the trucking community. Firstly with its products and now with these awards, MNAL has connected with the transport ecosystem at an emotional level. Coupled with its service back up and a sense of customer service, MNAL will, in times to come, become one of the most respected brands of the Indian trucking industry”. Congratulating Mahindra Navistar on undertaking this initiative of bringing laurels to the transport Industry, Shri Praful Patel spoke words of motivation in his keynote address and extended his heartiest congratulation to all the Award winners whose relentless pursuit for excellence gave them the winning edge. He said, “I urge the transporters present to adapt to current unprecedented economic changes and emerge victorious by investing in the future today. It is very important to imbibe industry imperatives such as innovation in technology, enriching partnership and transforming workforce that defines the path to prosperity. I convey my best wishes to Mahindra Navistar for their foresight and ingenuity in collaborating with multiple stakeholders through this first ever Transport Excellence Award and wish them all success in their future endeavors”. · Mr. Abdul Ghani, Fleet driver, Professional Automotives Ltd., won Super Outperformer Driver of the Year 2011 and a brand New MN 25 Truck. · Mr. Nitesh Agarwal, DARCL Logistics Ltd won the “Youth Transport Personality of the Year 2011” Award. · Mr. Ravindra Singh, R K Food Point Dhaba - first time ever winner of a Dabha award through driver votes. · In the Fleet Owners category, InLand Road Transport Pvt. Ltd., Cargo Wings and Siddhi Vinayak Logistic Ltd. won the National Awards. · In the Commercial Vehicle Financiers’ category, SREI BNP Paribas, Kotak Mahindra Bank Ltd. and HDFC Bank Ltd. won the National Awards. · In the NGO Category, Transport Corporation of India Foundation, Lokmanya Medical Foundation and Sangli Zilla Transport Association won the National Awards. The awards have set new standards for Indian transport sector in recognizing and rewarding the efforts of its key constituents. This will go a long way in encouraging the younger generation of entrepreneurs to look at the transport industry as an attractive proposition which gets its due recognition. In 2005, Mahindra & Mahindra Ltd. and International Truck and Engine Corporation - the operating company of Navistar - entered into a JV to manufacture light, medium and heavy commercial vehicles for India as well as global markets. The joint venture is in the process of addressing every segment of the commercial vehicle market from 3.5 tonne GVW to 49 tonne GCW with variants of passenger transport, cargo and specialized load applications.